15 entries categorized "History of my art career"
Next Monday, I will send off my application for an artist's fellowship from the Kansas Arts Commission. As part of the paperwork, I need to provide a one-page artist's statement "connecting the artist's work with process and career path". My usual artist's statement is much shorter, so I wrote a new one and later realized this is the perfect wrap up to the blog entries which documented my art career. Here is what I wrote. In 1993, I took some classes in traditional quilting and quickly became obsessed. My progress as a quilter was so rapid that I was soon teaching and winning major awards, but after a few years, I was making so many beginner samples that I was being dragged backwards artistically. 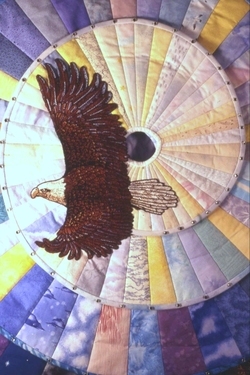 In the summer of 1999, I made the conscious decision to stop teaching and leave traditional quilting so I could concentrate on creating art, using quilting as my medium. After taking workshops and experimenting with materials and processes for a year or two, I created Discombobulated, which became the seminal work for my current style. It was the first time I had used quilting to create a three dimensional work and the first time I treated the quilt as if it were raw material rather than a surface to be decorated. This was a major turning point for me. 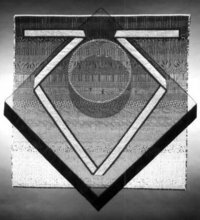 In the years since, I’ve used quilted forms as lines, planes, structures and even metaphors in my work. I credit the artist Eva Hesse and the architect Frank Gehry for showing me, with their own work, how to effectively move through and embrace physical space with an object. My past professions, particularly my time as a technical writer, have influenced my artistic voice the most. As a writer, I always wondered how a person could convey complex concepts without using words. As an artist, the answer has been to create my own version of a visual dictionary. Some of the words in my Definitions series reflect my technical background, but lately I have been adding even more layers of meaning to my work, including social commentary. I plan to continue doing this even more. My work isn’t easy to categorize, but I usually call myself a conceptual artist because the idea is the most important part. The finished works can take many forms, but I am best known for my freestanding work, so I also consider myself a sculptor. I may incorporate several different materials to get the effect that I want, but one or more quilted elements always appears in each piece. I love bold, bright colors and use them liberally to give excitement and energy to everything I make. In the future, I hope to create several large wall-mounted installation works based on the concept of graphs and charts, as well as continuing to expand my Definitions series. I’ve only begun to scratch the surface of my ideas. This is the last installment documenting my journey as an artist by year. In 2006, I spent a lot of time tending to the business side of art. I created a slide portfolio for the first time and reworked the look of my website, then collaborated with graphic designers to upgrade my marketing materials, including business cards, logo, brochures and CD portfolios. Two of my more successful works have been Discombobulated and Melted, but both were getting too old for entering shows. I would prefer not to be typecast with this "piled" style, but I created one more piece in a bright color scheme, called Tangled. Another work from this year was Prepackaged. I had more fun with this concept than almost anything else I've ever made. 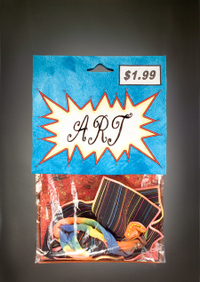 The vinyl bag is removable, so you can insert another artwork inside. On the back, I have a bar code, a reorder number and it even says Made in China on the label. I wasn't able to get text on the back in the way I wanted or I would have included the following. 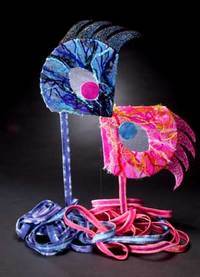 - Colorful fun for all ages! - Collect the entire series! - Easy to use. Instruction sheet included. I almost painted a red slash through the price and put a 99 cent clearance sticker on the front somewhere, but couldn't figure out where to put the sticker so it didn't ruin the overall look. One last work that I want to show you from 2006 is Knitted. The quilt in this piece is 1-1/4" wide by 70 yards long and the binding is all hand stitched. Here's a photo I took the first time I hung it on a wall in my studio, looking at the end of one of the knitting needles. You get a better feel for the scale of the work, which is about 8 feet tall and 5 feet wide. Now that I've shown you representative works from each year of my art career, I plan to write at least one more entry giving you the "why" rather than the "what". Stay tuned! 2005: The year my work really "Connected"
In 2005, I expanded my visual dictionary even further, plus I combined quilted forms with other materials more than I ever had before. The resulting artwork was some of my most successful to date. A couple of my favorites are Transformed and Triangulated, which were completed around the same time that year. In both works, the wooden supports have slots so the pieces fit together when installed, but condense down into much smaller packages for shipping and storage. They even have their own custom made storage cases, so all the pieces are protected and kept together. I particularly like these two pieces because they both take the idea of quilts to an extreme. The quilt is no longer just a surface to be decorated, but represents a concept within a larger design. As you can see, I was (and still am) infatuated with bright, saturated colors, so I couldn't resist throwing some in here. Lime green and hot pink never hurt anyone and they certainly get your attention! By this time, I was thinking so much in 3D that I had difficulty switching gears, but I still managed to make two wall hangings. Connected was made for a fabric company's special exhibit and the fabric is at least 50% from their product line. 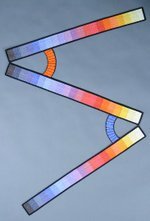 The three strips in Angled were originally meant to be the three quilts in Triangulated, but they didn't look right, so I created another artwork from them. Can you guess how many quilts are actually in each picture? There are probably more than you think, as I often create my work in units and then attach them together. Just to give you a hint, Connected is actually made from five separate quilts. 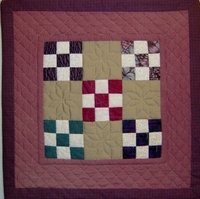 In 2003, I started adding major non-quilt design elements to my work. This was a pretty radical idea for someone who had been teaching "block of the month" workshops at the local quilt shop just a few years before. My first real sculpture was Tethered, which may look like it's made of metal, but the outer covering is actually cotton batting, the stuff you find inside of a quilt that makes it warm and cuddly. Even up close, the surface appears to be metal until you touch it. Another 2003 work was To Make a Long Story Short, created for a travelling exhibit of self portraits. It looks just like me, don't you think? The title comes from one of my father's favorite things to say, which was typically spoken just before he launched into his entire life story. Like him, I tend to be a storyteller that gets carried away, so the name seemed appropriate. 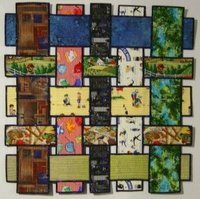 The ten quilts in this piece represent different parts of my life. Left to right: computers, domestic bliss, living in New York, dating, camping. Top to bottom: art, living in Kansas, childhood, cigars and technical writing. A bit of Jill trivia: I smoked cigars back in the early 70s, long before it became the in thing for Hollywood celebrities to do. 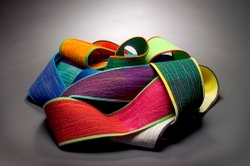 Moving on to 2004, one of my favorite works is Extruded. 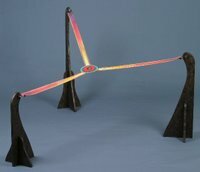 Like Tethered, the "metal" part is actually made of fiber. It's supposed to look like hot metal that is being forced out through a shaped opening, cooling as it comes out, even to the point that pieces are cracking off. I originally created Forest Floor to be a base for a creature I'd made, but they just didn't want to be together. The creature wound up being a standalone piece, called Creeped. Some people think that Forest Floor is one of the best things I've ever made, but because it's so different from my other work, I rarely show it. It looks rather fragile in the picture, but you can shake it upside down and nothing will fall off. The only part that is not attached is the spider on the web. There is a plexiglas cover which fits over the top and a custom and very well-padded storage case, which probably took as much time to construct as the artwork itself. During these two years, I was solidifying my style, which is to use quilts as if they are raw material, rather than finished products. The more I made, the more my work became about the concepts, so the finished works took many kind of forms, including framed, wall hung, freestanding sculpture, installation art or some combination of the above. The following year, 2005, I created some of my most interesting work, which I'll talk about in my next installment. 2002: So what do I do with these things? In 2001, I created Discombobulated, the seminal work in my Definitions series, which led me to make a larger version in 2002 called Melted. 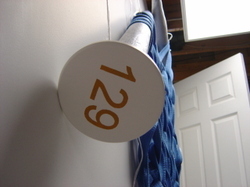 However, this concept was something of a one-trick pony and presented some very real installation problems. I needed to do something more with the "long, skinny quilt" concept, so I created several pieces which incorporated them in different ways. This is Emotional Entanglement. The two pieces are separate and meant to be hung so the mouths touch. When Mary McBride exhibited this at the Atlantic Center for the Arts, she said that the two heads would sway back and forth in the drafts and look like they were kissing, but sometimes the pink head would turn completely away like she was saying "Sorry, not tonight". I don't count this as part of the Definitions series because it doesn't follow the naming convention, but if I had named it Entangled, it would probably fit right in. Another experimental work from that year was Simple Yet Elegant. I wanted to create a black and white artwork and many people who have seen this in person think it's one of my best works. However it's never been juried into an exhibit. My photographer tried his best to capture the sparkle of the rhinestones, but was not able to, meaning that the slides never did it justice. The silvery part is actually a separate quilt, created with three layers of heavy duty aluminum foil as the "batting" and silver mesh fabric as the outside layers, with black cotton fabric for the binding. The silver quilt is sewn on top of another overlay, which is made from fiberglass window screening. I was getting closer, but still had some refinements to make to my new style. Stay tuned for 2003. Same bat time, same bat blog. This is a continuation of the story of how my art got from there to here. In 2001, just for the fun of it, I made a really long, skinny quilt that was two inches wide by 10 yards long. The colors were great, but I had no idea what to do with it. I tried weaving it back and forth on itself, but that didn't look right. For a while, I took it along when I gave school presentations to little kids in our local "artist in the classroom" program. At the end of every presentation, I'd ask "Who wants to be wrapped up in a quilt?" I'd gather everyone in the center of the classroom, pull out the quilt, hand one end to the teacher and start running circles around the group of kids, unrolling it as I went. I could usually do about 3-4 laps before I ran out of quilt. One day, I was participating in an teacher showcase. I showed the quilt to someone and left it in a pile. Another artist cruised past my table and casually said, "I like it that way". My ears perked up and, for the first time, I started looking at the quilt as a three dimensional object instead of a two dimensional surface to be decorated. A messy pile was perfect. Soon after, a word discovered in a friend's email provided the name that I had been looking for, Discombobulated. 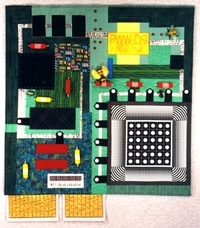 This artwork has been displayed in some wonderful art shows around the country and is currently on exhibit at the Visions Art Quilt Gallery in San Diego as part of the Thomas Contemporary Quilt Collection until August 15, 2007. Whenever anyone sees Discombobulated on exhibit for the first time, they always laugh. It's probably leftover laughter from all the little children it wrapped up, once upon a time. This was the beginning of my current style of work. 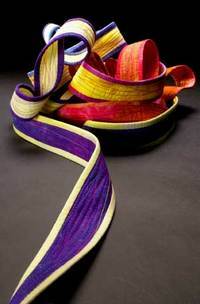 Because of the success with Discombobulated, I created a larger version in 2002 called Melted, which was 6 inches wide by 19 yards long. Since then, Melted has been accepted into some of the top art shows in the country. With these few exceptions, the individual pieces didn't really resemble each other much. To provide some form of cohesiveness to the series, I adopted a naming convention, specifically one word that ends in -ed. The names I chose described the work, which meant the artwork became the visual definition for the title. This "visual definition" concept was growing inside of me more with each new piece I created. In the next chapter, I'll talk about other early works in this series. 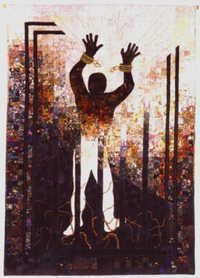 I began 1999 with a commission from a very talented jewelry artist here in Wichita, Jed Closson. He'd seen my first solo show the previous October and asked me to make something for him. I named the finished piece Collaboration3 ("cubed") because it included work from three different artists. The stitchery in the center was made by Jed's mother and he created the beautiful silver pin that's attached beneath it. There are actually two quilts here, joined along the top edge. Around the same time, I was still reverting to some of my earlier pictorial work, with pieces like Butterfly Garden II. Here's another work from 2000 and you can see that I was playing more with the third dimension. A number of large objects are attached, plus several smaller quilts are layered are on the surface. The name for this piece was my favorite line from when I worked as an IBM systems engineer (software expert) years ago. If someone telephoned me with a computer problem, I loved to tell them, "Sounds Like a Hardware Problem to Me". This period, from 1999-2000, was a transitional time for me. I had no idea where I was headed with my artwork yet. I enjoyed playing with a number of interesting elements, but something still wasn't quite right. My work still had a "quilt show" air about it and I couldn't quite put my finger on the problem. In the meantime, I kept making quilts in a wide range of styles. I also took a local class in hand dyeing, which gave me more control over the look of the fabrics I was using. At this stage, I was new and artistically gawky, so I floundered around a lot. It was really the following year, 2001, when I found my mature artistic voice. In 1998, I made a list of my best quilts, sorted by year. I was shocked to discover that I wasn't able to list a single thing from 1997. I had spent the entire year making sample projects for the beginning quilting classes I was teaching at a local quilt shop. I had always been happiest when I could push myself a little further with each project, but now I found myself sliding backwards. I did a lot of soul searching during the entire next year, because I knew that I couldn't move forward with my own work and still continue teaching traditional quilting. Another problem was that my pictorial quilts were much more appropriate for traditional quilt shows, which are sometimes called pipe and drape shows because of the way the quilts are hung. 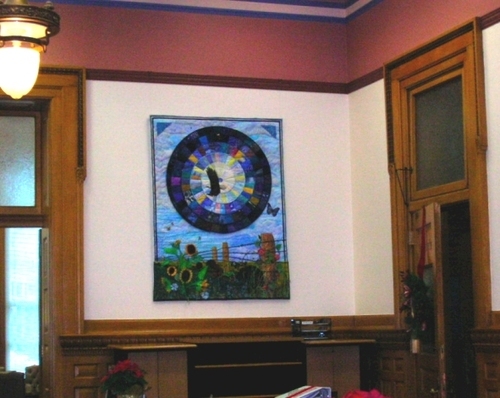 However, I wanted to show my work primarily in art quilt shows, which are exhibited in gallery settings. 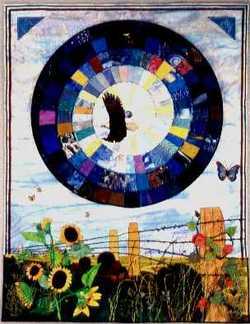 I'd had tremendous success with my pictorial quilts and giving up that level of security was very difficult for me. In fact, I stewed about it for close to a year. I knew that art show jurors were looking for a lot more than my pictorial quilts were delivering, so I had to make some changes if I wanted to compete in that arena. 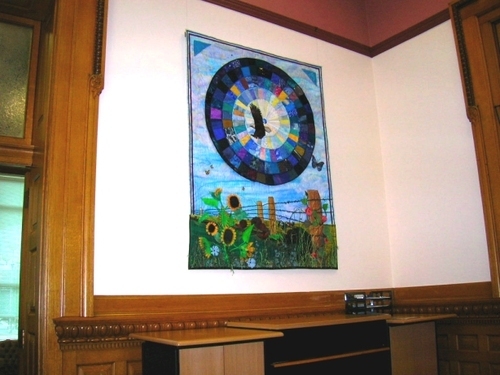 In 1998, I collaborated on a major project with two other quilters and won an international award for our work, called Breaking Free. This is a picture of the front, but the back has an equally powerful design on it. In fact, the International Quilt Study Center, the current owner of the quilt, used the back to illustrate two of their biggest press releases. This quilt was one of the last pieces I made that was intended for pipe and drape shows. A few months later, I made a conscious decision to break with the traditional quilting world and work on developing my art. I didn't make any more traditional quilts after that, I stopped going to quilt guild meetings and I stopped teaching. I was adrift on the turbulent sea of the art world and I had no idea how to paddle. To fix that problem, I drove to Ohio in the summer of 1999 and attended a two day class taught by Caryl Bryer Fallert at the Quilt Surface Design Symposium. That class taught the business end of art, such as how to create a portfolio, record keeping and photography. It also introduced me to the world of juried shows and galleries. That class, in retrospect, was the turning point in my career. One day I was a traditional quilter and the next day I was an art quilter. How did I get here? And where is here? Most people who have seen my current artwork don't realize that I started as a traditional quilter. In the early 1980s, my sister had her second child and I decided to make quilts for each of her kids. I knew how to sew, so of course I didn't think I needed to learn anything about quilting. I created a couple of simple four-patch quilt tops, each one made with two calico fabrics and constructed with one-inch seams. I put them aside for a while because I didn't know what to do next. The tops didn't look right and I hadn't heard about quilt borders yet. When her third child turned ten years old, I decided to finish the quilts. By the time I finished the first two plus the third one, a Rail Fence design, I was somehow calling myself a quilter. This mauve ninepatch is the first quilt I made after that. It's dated March, 1993 and about 14" square. Yes, it's hand quilted and has quarter-inch seams. 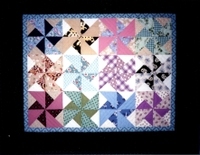 A pinwheel quilt from 1994 is called Everything Old is New Again, because it was made from 1930s and 1940s fabrics. This was back in my "black border" period, when I rescued a lot of antique fabrics and thought it was cool to use them. I finally took a few lessons at a quilt shop and a neighbor convinced me to attend the local quilt guild meetings. I was totally hooked! At one point, one of the guild members demonstrated a technique called foundation paper piecing and I began making very small quilts, while playing with fabric placement and design. My first art quilt, called First Morning at the Cabin, used this construction technique. I was still in my black border period, as you can see. For several years, I taught traditional quilting at local shops and even taught nationally a couple of times. During this time, I started winning awards for my pictorial quilts, including an award in the Hoffman Challenge, a well known exhibit. 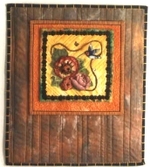 You can see my pictorial quilts at a hidden page on my website. Shhh! Don't tell anyone where you saw these. I don't normally show them to people anymore.